Text only list of complete published works, including awards and honors. and a great load roar. I'm a huge ferocious hunter. A little boy pretends to be different dinosaurus--and even a baby dinosaur just hatching from his shell--until his mother joins him with a snack and plays the role of mother dinosaur. Reviews STARS from PW and ALA Booklist! Take cloth and buttons and thread. Add a classic nursery rhyme and a counting game. Stitch them together and what do you have? A patchwork of numbers and fun! With bold and beautiful quilted illustrations, author-illustrator Anna Grossnickle Hines has created a read-aloud that's sure to become a cozy household favorite. See the step by step process of creating this book. Reviews STARS from Kirkus and Booklist! Winner of the 2001 Lee Bennett Hopkins Award for Children's Poetry! 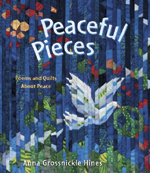 Nineteen handmade quilts grace the pages of this collection of seasonal poems. Taking inspiration from the magic that is winter, spring, summer, and fall, and stitching together varied forms of poetry (including haiku) with something entirely her own, Anna Grossnickle Hines presents her vision of nature's year-round drama. The author learned to quilt from her mother, and her talent and enthusiasm for the traditional craft are evident on every glorious page. A fascinating note on the making of the quilts is included. Reviews STARS from Kirkus, Booklist, and Publisher's Weekly! Things To Do: Including quilt patterns for fabric and paper. Quilts, Dolls, and Books: How they tie together in the author/illustrator's life. The illustrations "capture the circumscribed world of the preschooler while celebrating the joys to be found in daily events...Corey has parents who share household tasks to make his life, as well as theirs, not only secure but also fun. The book conveys the kind of marital respect which can exist within today's family with charm and vitality." Horn Book 9/86.